A manicure is a treatment for both your hands and your nails. It has many aesthetic benefits and it can also improve the health and appearance of your hands and nails. Shellac manicure is becoming more and more popular nowadays because of the fact that it is a more durable option than other nail treatments. This treatment can last a month without any chips, breaks or need for any extra coat. It is a manicure that will make all your dreams come true but you have to make sure that you visit a properly licensed facility which is totally hygienic because the treatment can harm you if it is not done properly. We at Shumaila’s have the best resources and experts to perform Shellac manicure and give you its best experience. Shellac nail polish is the best choice to have durable nails but it is not suitable to everyone. In order to have shellac manicure you should have healthy nail beds. Unhealthy nail beds can affect the durability of this treatment so it is recommended to solve such problems before having a shellac manicure, so that you can enjoy its full benefits. 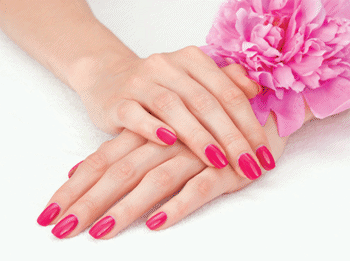 You can avail Shellac manicure in an array of colors. There are almost 60 colors available in our collection at Shumaila’s which you can have on your nails. The main benefit of shellac manicure is its durability. Almost every shellac treatment can last up to 20 days at minimum. Many people have also claimed that it lasted a month for them. In some cases the nail growth rate of different people can also reduce the durability of the treatment. You should keep in mind not to use any other chemical products after having shellac manicure as they can cause harm to your skin. 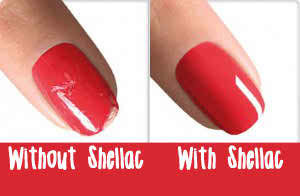 Shellac cannot be easily removed with a nail polish remover commonly used at home. In order to protect your nails and cuticles there is a special treatment to remove it. It is highly recommended to visit a salon to remove shellac. In the salon your nails will be socked in a special acetone and then they will be wrapped so that your body heat can help to remove shellac manicure. Some people think that shellac manicure can help their nails to grow faster in length, which is totally wrong. Shellac does not help it the length of the nails and you should keep in mind to have shellac manicure when you have the desired length for them. Shellac manicure cannot be performed at home. It is necessary to perform it at a salon. The shellac manicure treatment requires a special type of Ultra Violet (UV) lights. The light is applied between three coats of polish. These lights are not sold for home use and only properly licensed salon with experts are allowed to use them. Even with all these limitation Shellac manicure gives your nails and hand a totally new level of opulence. So, to have outstanding, shiny and pretty nail visit us today!